OCEANSIDE — More than 140 gathered at the Civic Center community room to hear what the North County LGBTQ (Lesbian Gay Bisexual Transgender Questioning) Resource Center accomplished last year and its plans for the year ahead. The whole community was invited to the annual North County LGBTQ town hall meeting on Jan 31. Mayor Jim Wood, Councilwoman Esther Sanchez and Police Lt. Leonard Cosby were among those in attendance. “One of our goals is to make our community aware of who we are and what we do on a daily basis,” Max Disposti, North County LGBTQ executive director, said. To help those in attendance gain a better understanding of what the center accomplishes, the meeting opened with a readers theater of testimonials that shared why people came to the center. “The 12-step meetings help me stay on track,” reader three said. North County LGBTQ has close to two dozen collaborations with health, mental health and other experts who help provide services at the center. The center also provides police, schools and other organizations with outreach training to help personnel better understand the needs of LGBTQ individuals. Cosby said training by North County LGBTQ has helped police officers have better rapport with LGBTQ individuals. “When you have to act and respond you don’t want to respond by insulting someone,” Cosby said. The center’s accomplishments also include annual awareness events such as Pride at the Beach. Disposti said due to its success Pride at the Beach will be held at a larger venue off the beach next year. An overview of the nonprofit’s funding was also shared. The center has doubled its annual budget to $140,000 and that has enabled the center to hire the executive director who had originally been working voluntarily. A bigger budget has also allowed the center to expand its space and implement new programs. About 10,000 people use the center annually. Those who use the center are from all age groups, ethnicities and sexual orientations. “No one is left out,” Disposti said. Funds are raised through grants, AIDS walks, the center’s annual gala and contributions. More than 50 percent of center’s spending is on its programs. The rest covers staffing and facility rental. 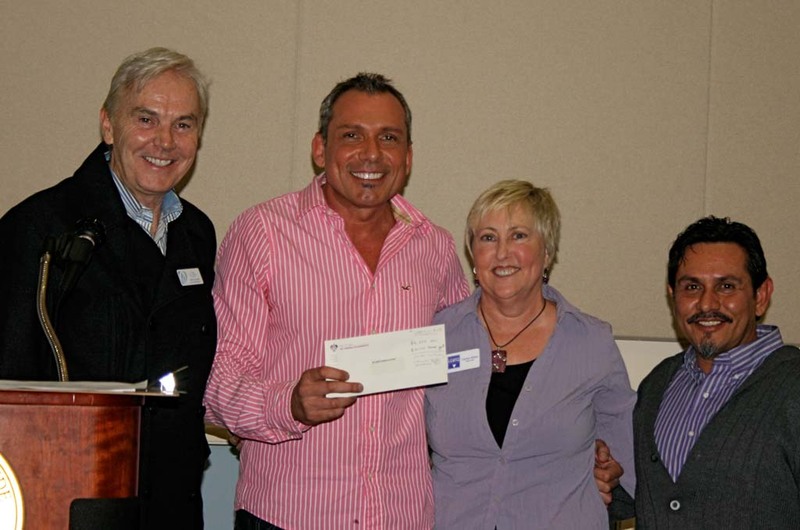 At the meeting the San Diego Human Dignity Foundation gave North County LGBTQ a $7,175 check to expand its HIV testing. The funds allow HIV testing to expand from one to three days a week. There was also a question and answer session to gather input on community needs. Among the center’s goals for the year ahead are to secure more private sponsorships, achieve more visibility in North County, and increase its programs for seniors and youth.